Yes, You Can Finally Have a Complete Smile! Are smile gaps causing you frustration? Enjoy the benefits of a complete smile by getting dental implants in Park Ridge, IL. Would you like to be able to permanently replace your missing teeth? A dental implant is the surgical way to get the look and function that comes from a natural tooth. Not only are dental implants made to mimic the appearance of teeth, but they are just as strong as normal teeth, too. In fact, you might not even remember that you have a dental implant because you can treat it like the rest of the teeth in your mouth! Contact North Shore Dental Group at 847-292-8200 to make an appointment to discuss whether you are a candidate for dental implants in Park Ridge, IL. Candidacy depends on numerous factors, including your bone density and tooth loss site. Dr. Luma Naim will evaluate you thoroughly and provide her recommendations after your initial exam and consultation. 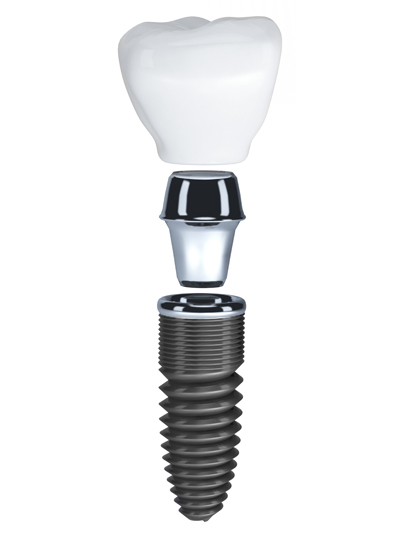 There are 3 stages to the dental implant process. Stage One: The post of the dental implant is surgically embedded into the area where your tooth used to be. This post takes the place of a natural tooth root, massaging the surrounding bone and keeping the bone from being reabsorbed into the body. Stage Two: After several months of healing, the post will be ready to hold an abutment. The abutment sticks above the gumline and will ultimately attach to a permanent dental crown. After the abutment has been attached to the post, a temporary tooth crown will be bonded to the site so the abutment is covered. Stage Three: After a few days, you will return to the office for your final permanent dental crown attachment. The dental crown should last for at least 20 years after it has been properly positioned and bonded to abutment. From that point, you can eat and drink as you ordinarily would. The dental crown requires no special treatments; simply make sure you are brushing and flossing twice a day or as directed by your dentist. Are You Missing a Full Arch of Teeth? 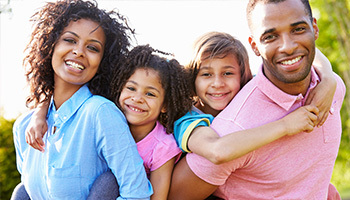 Learn About Teeth-in-a-Day! If you are missing an entire row of teeth, an efficient way to get a full smile is with implant dentures. 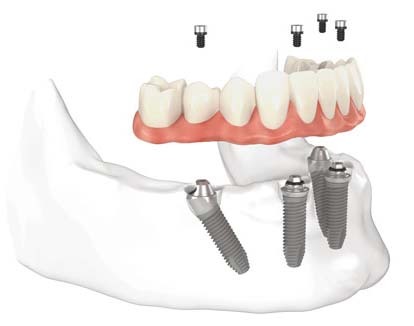 Implant dentures use the same technology as dental implants and give you the result of teeth in a single day! By bonding a permanent prosthetic to four specifically positioned posts that have been surgically embedded in your mouth, you can get the look and feel of natural teeth. This is truly an incredible advantage for people who have lived for too long without teeth. Call 847-908-8102 to find out how to make an appointment to discuss getting dental implants in Park Ridge, IL, at North Shore Dental Group.